Our stock multi-product displays offer highly versatile, affordable, and configurable solutions to merchandise a wide range of products. Choose our MPM-XP spinning tower or one of our mobile 2-sided grid displays. We offer a number of merchandising accessories such as sunglass panels, shelves, hooks, cap pockets, baskets, and sign holders. Our multi-product displays are high quality and built for durability. All of our fixtures feature knock-down construction and are economical for shipping and storage. It’s easy to configure any of these displays to meet your merchandising program needs. The accessories can be changed to support product rotation or seasonal/promotional programs. 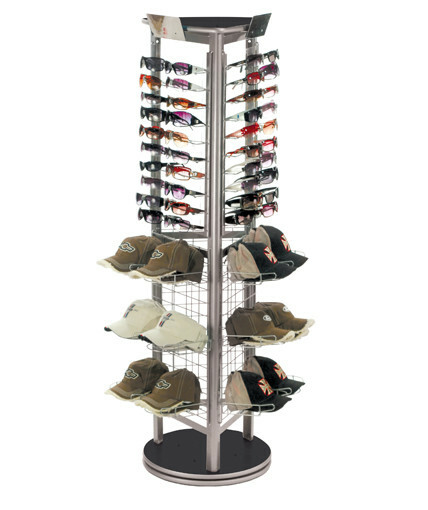 Our multi-product displays are ideal for sunglasses, caps, footwear, and other apparel items, as well as any product that is merchandised on shelves or can hang on hooks. Our displays work well in almost any retail environment including convenience stores, grocery stores, apparel stores, mass market retailers, specialty retailers, sporting goods stores, and many other types of retail stores. 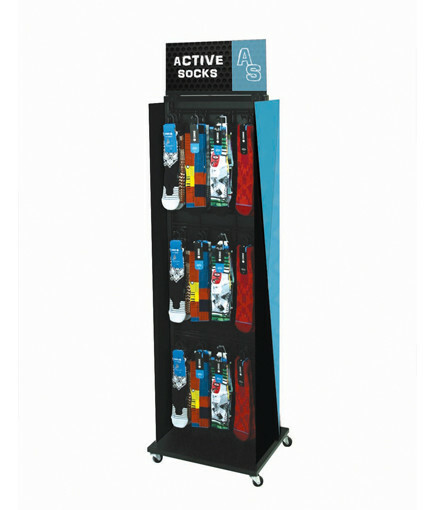 Adding header signs, side signs and shelf signs can help you turn any of these fixtures into a heavily branded display. We have in-house printing capabilities and can work with you to create the right signage to promote your brand. If you don’t see a multi-product display that you like, let us know, and we will design a custom display for you.